This degree uses a flexible, blended approach, so face-to-face lectures, seminars, and tutorial support are complemented by online resources, interactive learning tools, and self-study materials. All modules are designed to offer students a shared learning experience with other students and module tutors while remaining flexible to demands of everyday life. Additionally, the course team incorporate a wide variety of assessment strategies, which may include formats such as essays and reports, critical reviews and commentaries, informed discussion and debate, analytical exercises, individual or group presentations, and project-based or work-experience reflections. In the final stages of your degree, you also have the opportunity to conduct a small-scale research project with the support and guidance of experienced supervisors who are experts in their field. All taught sessions take place at our main campus in Ipswich and online materials are made available through the virtual learning environment, Learn. To offer an innovative, dynamic and flexible programme that critically considers developments in the academic study of childhood and the changing contexts of childhood in a globalised world. To critically explore the cultural and social constructions of childhood and the implications that they have had and continue to have on children's everyday lives. To advance students knowledge of the complexity of understanding the relationship between children's rights, the ideologies and responsibilities for welfare and the lived realities of children's diverse experiences. To provide a robust theoretical framework for students to develop an integrated and critically aware understanding of childhood studies and to cultivate a critical and analytical approach to contemporary methodological advances in childhood research. To develop in students a range of intellectual skills reflecting both the ethos of lifelong learning and the rigour required at Masters level, a high level of student autonomy and self-direction in order to facilitate the student to demonstrate initiative, originality alongside integrity and ethical judgement in their advanced scholarship and to become influential and effective specialists in the field of childhood studies. The University of Suffolk subscribes to the Alternative Guide to postgraduate Funding Online which is all about alternative sources of funding especially charities which can make awards (fees, maintenance, research costs) to any student regardless of subject or nationality. This is free for all students and staff to use. If you are a prospective student who has applied to us, please email the Graduate School at graduateschool@uos.ac.uk to get a Prospective student Access PIN. A professional and Career Development Loan is a commercial bank loan that you can use to help pay for work-related learning. The University of Suffolk is a professional and career development loans registered learning provider, registration number 20055. For further information on financial assistance to support your learning, contact the National Careers Service on 0800 100 900. This database contains information on funding opportunities available through outside organisations. Postgrad Solutions Ltd is offering Postgraduate Study bursaries for 2015-2016, Each bursary is worth £500 and they are open to students from anywhere in the word. Taught modules run from September to June, and the summer is used for independent study and research. Taught sessions take place on Saturdays at University of Suffolk main campus in Ipswich, leaving the rest of the week for independent study and work experience. To attain the full MA, you will need 180 credits, for the PgDip 120 credits, and for the PgCert 60 credits. A full-time student can expect to study 120 credits from September to June and undertake their dissertation in the summer term. A part-time student will take either 40, 60, or 80 credits per year as taught modules, and finish their dissertation after all taught modules are completed. If you have further questions about the content of modules or would like to see a draft timetable, please get in touch with the course leader, Maureen Haaker. Part-time tuition fee: £870 per 20 credits (please contact the Infozone for further information). 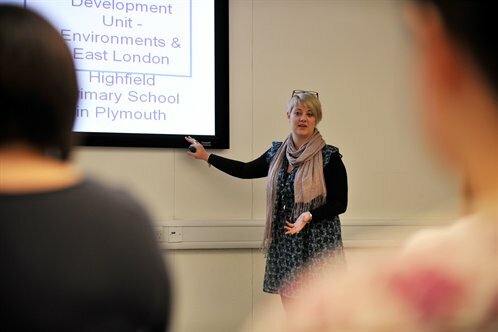 The BA (Hons) Early and Primary Education Studies degree is engaged in acknowledging the potential of education to support the transformation of individual and community living. A work-based programme that enables those working with young children to progress towards graduate status.